How did an Irish schoolboy become the lead singer of a world-famous rock band and the founder of several humanitarian groups? 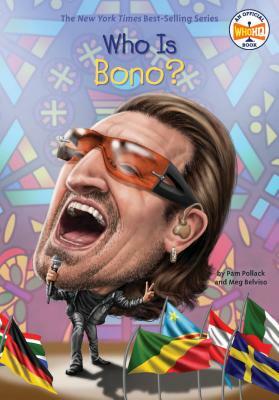 Track Bono's rise to fame in this exciting addition to the Who Was? series. By age 16, Paul David Hewson was such a good singer that he had earned the nickname "Bono Vox," a Latin phrase that translates to "good voice." When he became the frontman of the newly formed rock band U2 in 1976, he adopted part of the nickname and "Bono" was introduced to the world. Today, U2 have sold over 157 million albums and won numerous awards, including 22 Grammys. In addition to having stellar vocals and a compelling stage presence, Bono is also recognized for his commitment to social justice. This book shares the story of this charitable rock star who has been named a "Person of the Year" by TIME magazine and who is recognized as a global icon of goodwill. Pamela Pollack and Meg Belviso are authors of several books in this series, including Who Is George Lucas?, Who Was Alfred Hitchcock?, Who Was Susan B. Anthony?, and Who Was Alexander Hamilton?